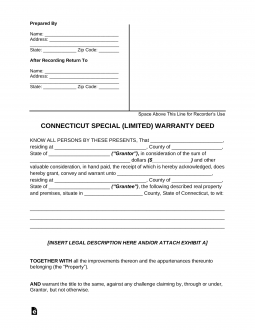 The Connecticut special warranty deed is similar to a warranty deed in that there is some guarantee, but it provides less of a guarantee to the grantee (buyer). The grantor (seller) is stating in a special warranty that they have not done anything to compromise his or her interests in the property since he or she acquired the property. However, the seller makes no guarantees as to what happened before seller acquired the property. In order to be sure what property you are acquiring, it is important to make sure a title search is completed. A title search goes back over the transfers of the property over a number of years. The records are held at the town clerk’s office. Any claims against the property have to be filed with the town clerk. Step 1 – Print the name of the grantor or seller in the first blank along with the grantor’s address. Step 2 – Check the box indicating the marital status of the grantor. Step 3 – Fill in the amount of money paid for the property, both in numbers and words. Step 4 – In the next blank, fill in the buyer’s name and address, also known as “grantee”. Step 5 – Check the box which shows the how the buyer will be holding the property. Step 6 – In the next section, fill in the description of the premises being sold as indicated. Step 7 – If there are any restrictions to the transfer, you should put that in the next section. This could include any known liens or easements. Step 8 – Fill in the deed recording information of the previous deed to the property. Step 9 – Sign and date in front of a notary with two witnesses.